All of the wood I’ve been getting recently comes from Hearne Hardwoods, a lumberyard in south eastern PA. All of their lumber is rough sawn to about 1″ thick. This is know as 4/4 and when milled down it becomes 3/4″ thick. When the boards are sawn by the mill thy are still green from the tree and after being dried they can cup, warp or bow a bit. By removing a 1/4″ of material this allows you to end up with a perfectly flat, straight board. 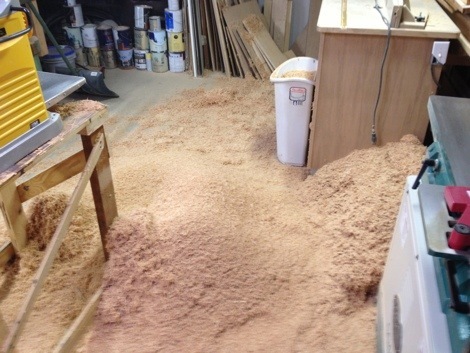 Downside of it is that you create an awful lot of sawdust. Since I dont have a dust collector this all ends up on the floor of my shop.